Four our five years ago, while I was still in college, you could usually find me at Goodwill on the weekends. You could usually find me shopping the sale racks at super-cheap mall stores too. It wasn’t that I was donating things or using the one-in/one-out strategy that keeps so many closets in check. 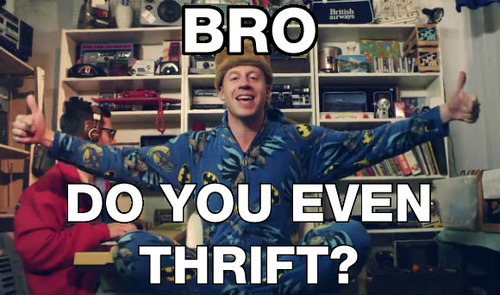 In fact, I think it was my frequent thrifting that took my two closets from stuffed to overstuffed. Before I talk about the reasons why I no longer thrift, I need to clarify: I love buying secondhand. I think thrift stores are an amazing way to get things you need without contributing directly to the worlds of fast fashion and fast everything. What I don’t love is thrifting for the sake of thrifting – it became a mindless habit for me and I didn’t really need the things I usually brought home with me. One of the big issues I now find with my thrifting was that I too often saw something that looked interesting and bought it based on price alone. It doesn’t fit perfectly? Well it’s only five bucks. It has a stain or a tear? Well it’s half off and I could probably fix it or wash it out. I ended up with a bunch of cheap clothing that looked and felt cheap. I would wear something once and realize I didn’t like it as much as I had initially thought. At that point it would fall to the depths of my closet and I wouldn’t see it until years later when I started my simplicity journey. I was also a mindless shopper. I would go to Goodwill when I was bored or when I had extra time. I think I was even using thrifting as a way to cope with stress. If I had a bad week, I’d go buy a blazer that was too big for me. If I had a good week, I’d buy a dress that maybe actually got worn more than once. You get the picture – it was just as bad of a habit as going to the mall with a credit card and no real reason to be there. I’d buy fun things to put on my desk, my nightstand, my walls, and none of it was there intentionally. It was just there. Now I only go to Goodwill when I need to. On Halloween, my husband and I were able to get almost everything we needed for our costumes there (we went as Bojack and Princess Carolyn from a show called Bojack Horseman). When I do go, I try to have a very specific intention. Am I there for workout gear? Then stay away from the dresses. I’ve also found that buying online is helpful (eBay and Shop Goodwill are my favorites). Buying secondhand things online is a little risky since you can’t see exactly what you’re getting beforehand, but that adds just enough hesitation to the process. That way, if you really don’t need something, you have a little more time to think it through. I wrote a post over two years ago about dressing like a million bucks (without spending a ton) that still holds true. Speaking of clothing, I am planning a wardrobe overhaul this year. There are quite a few pieces that used to bring me joy that don’t anymore, and I’ve been researching some ethical clothing brands that I may integrate into my wardrobe along with quality used items. As always, it’ll be an intentional process with a simple outcome. So look out for posts in the coming months about that! What shopping habits do you have (good or bad)? This entry was posted in Home, Minimalism and tagged fashion, minimalism, secondhand, shopping, simplicity, simplify, style, thrift stores. Bookmark the permalink. This was exactly where I was. I would buy it, not wear it, but didn’t want to let it go. Finally, all these old clothes gave me the creeps and they are gone. I feel better having only what I will wear in the closet! Isn’t it funny how easy it is to just keep things for the sake of keeping them? I love that you said they “gave you the creeps” because I totally understand that. It helps to have less, because then you really do grow more fond of what you do have, and I think it’s helped me to define my style much better. Thanks for sharing! So much yes! Emily Torres perfectly expresses my thoughts on op shopping (Australian for thrift shopping). These realisations are exactly what pushed me from a Buy Nothing New challenge in 2012 to my current Buy Nothing Year. Restricting my purchases to secondhand ones just shifted my mindless, excessive shopping from the usual shops to secondhand shops, ebay and online classifieds. I still binge shopped. Now that I’m on a decluttering spree, guess what? Most of the stuff I mindlessly bought at op shops is going back to where it came from. I sometimes wonder if I’m purging myself of an item for the same reason its previous owner did, and how many owners came before that. How many people have followed the same path of minimalist enlightenment by ridding themselves of pants with scratchy waistbands or chipped teapots? I’d love to hear your thoughts. Do you fall into the same trap of secondhand shopping?